瀬﨑 明日香 | Artists | 株式会社オーパス・ワン | Opus One Co., Ltd.
Asuka Sezaki started playing the violin at the age of six. After studying under Prof. Chikashi Tanaka, Prof. Seiji Kageyama and the solo concert master, Masafumi Hori, of NHK Symphony Orchestra, she graduated head of her year of Tokyo University of Fine Arts and Music. 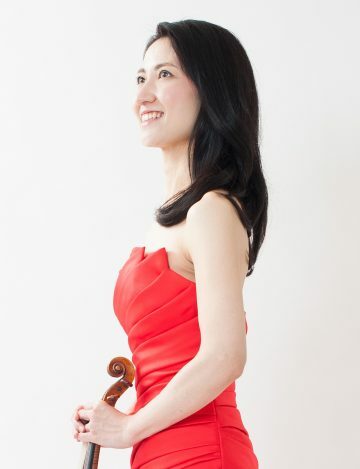 She furthered her study for five postgraduate years at the Conservatoire National Superieur de Musique et de Danse de Paris, where she was taught the violin by Prof. Regis Pasquier, Prof. Jean‐Jacque Kantorow and chamber music by Prof. Christian Ivaldi, under a full scholarship from the Cultural Agency of Japan. She won the 64th Japan Music Competition and ranked 3rd in the Leopold Mozart International Competition in 1995, came 4th in the Henryk Wieniawski International Competition in 1996, and received the highest award in the Trio di Trieste International Chamber Music Competition in 2003, as well as winning the Forval Scholarship Stradivarius Competition in 2005. She was invited to perform in leading festivals, including the Festival Reims, Bourgogne and the Festival de I’Orangerie de Seaux in France. 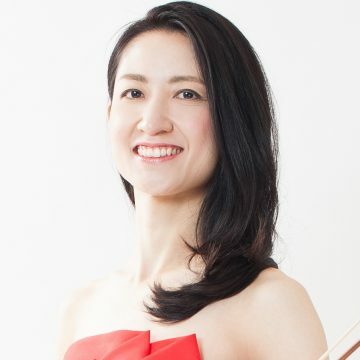 She has frequently performed with orchestras such as ; Yomiuri Nippon Symphony Orchestra, New Japan Philharmonic, Tokyo Metropolitan Symphony Orchestra, The Japan Philharmonic Orchestra, Tokyo Philharmonic Orchestra, Tokyo City Philharmonic Orchestra, NHK Chamber Music Orchestra, Sapporo Symphony Orchestra, Osaka Philharmonic Orchestra, Kansai Philharmonic Orchestra, Nagoya Philharmonic Orchestra, Central Aichi Symphony Orchestra, Munchener Rundfunk Orchester, Orchestre de Bretagne andCamerata de Bourgogne. She also plays with such musicions as Jean-Jacque Kantrow,Regis Pasquier, Tsuyoshi Tsutsumi, Noboru Kamimura, Jean-Claude Pennetier, Katumi Ueda, Kazuoki Fujii, Akiyoshi Sako, Hiroyuki Iwaki, Kenichiro Kobayashi, Naoto Otomo and Junichiro Hirokami. In 2011, she performed in Poulenc International Week in Paris,Classic Festival by Japan Federation of Musicians, etc. Also, she aggressively participates in charities or outreach activities playing as the concertmistress of the orchestra led by Kenichiro Kobayashi at Special Olympics, working in adviser of environmental foundation of Sanders Perry, cosmetic company, and a member of a board of Chiba City Cultural Development Division. In April 2012, she played Violin Concherto No 1 by Bruch with Japan Philharmonic orchestra conducted by Kenichiro Kobayashi at Suntory Hall, Tokyo and Aichi Prefectural Art Theater, Nagoya. In May, performed Beethoven Triple Concerto with New Japan Philharmonic. Since autumn in 2011, she has been studying under Felix Ayo in Italy as a scholarship student by ROHM Music Foundation. Her first CD, six sonatas for violin solo by Eugene Ysaye, has been released from ALM RECORDS（Kojima Recordings）,with honors for a blue-ribbon disk and in the second CD, she plays Saint-Saens’s works for violin and piano with Prof.Emmanuel Strosser in the Conservatoire National Superieur de Music et de Dance in Paris.